Spring is in the Air…. our 29th Annual Fashion Show is here! 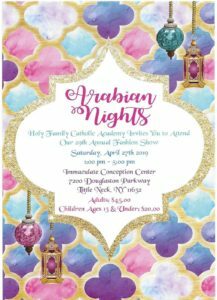 This years theme is Arabian nights… come join us on Saturday, April 27th at the ICC Center in Douglaston from 1pm-5pm for a wonderful afternoon of Fashion, Food, Baskets & those fabulous Luxury Raffles! Click here for Luxury Raffles…Fashion Show Luxury Raffles . For those not planning to attend just be sure have your Luxury Raffle tickets in by Monday, April 15th.